I had just recently gotten a Blu-ray write finally. Now, say goodbye to my DVD writable, or so I thought. While Data and other files has absolutely no problem with a BD-R or BD-RE (Yes, I do not know why, but they decided BD-RW doesn't sound good), it becomes a complication when it comes to the media like music and movies. Lets leave the AudioCD part out of these, since its still in the legacy CD format. Take a look at DVD. I had always used DVDFab to "squeeze" DVD9 into DVD5 and it works like a charm. Lose some sound quality, but the video is usually 100% well kept. (Yes, don't we all hate the FBI notice delay and ads and to be honest, I think DVDFab should sell this as their prime point. Not sure if the FBIs are so happy about it though. OK, this is where I am finally going to talk about why we can't do without DVDFab for Blu-ray. I had check out many (Yes, about 10 or so) who claim they can squeeze a Blu-ray without (much) loses. WEll, before that, let me stress that most Blu-ray out there simply are dual layers. Well, not that you get great quality or something, there are usually about 29GB (Single layer only houses 25GB) and I can't help thinking, they had done it on purpose so that people cannot copy it 1-1. And for me. BACKUP is a must. Especially when you own a Blu-ray, you would share with friends (and god knows, maybe even their dogs) all over. I do not want to have to pay almost USD40 and then, well own a very expensive coaster. So I insist on backing up my Blu-ray. Well, why not buy a BD-RE DL? Yes, why not? It's just about 8X the price of the single layer! This is where DVDFab comes in. In most of my "test" (I own the Blu-ray by the way! ), most of the "Extra" bytes comes from the previews or additional language tracks. And in Blu-ray, audio track is crazily large, especially when they are in 7.1 Digital or something. It's crazy! And I don't really care about the Russian language, for example. So these goes and all done nicely by DVDFab. In fact, I do not really even need to give up on quality on most of the movies. So its like 1080p, without some audio and definitely without FBI warnings and previews (by the time I watch these preview, the show is probably out anyway). And all this via DVDFab. The current DVDFab comes with 2 major version, version 9 comes with the newer interface, but I prefer the old interface more like the above. There is a trial version which you can try for 30 days and decide for yourself if you want to buy it. 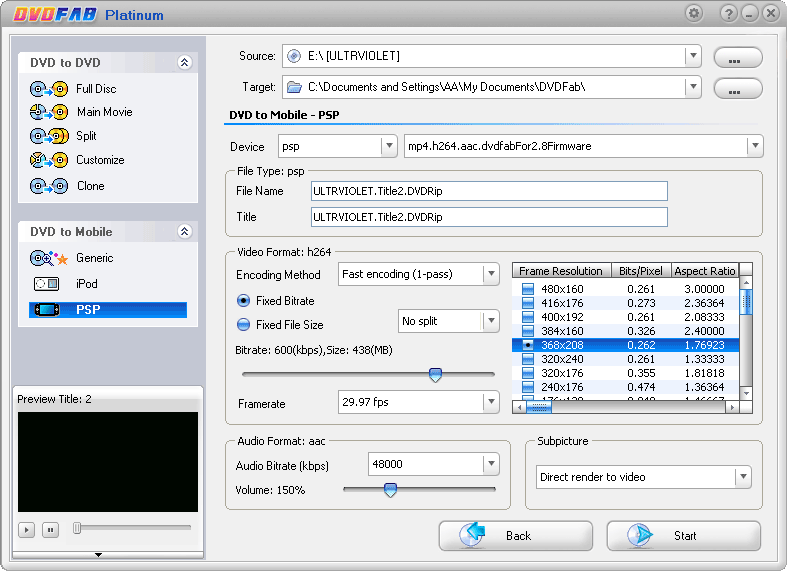 Last, but not least, DVDFab does not require AnyDVD or other decrypter to decrypt the content of the DVD or Blu-ray! So, that's a bonus! Well, I do not work for DVDFab in case you are wondering and there is no referral bonus or anything from my link.